Ever since the first prehistoric humans learned how to harness fire for warmth, protection and cooking food, we’ve been in awe of the power of the flame. It doesn’t matter whether it’s a blazing campfire in the woods, prayer candles glowing in a majestic cathedral, or lightning ripping through the sky, fire inspires awe in us. It’s spiritual, transformative power in our lives cannot be denied. 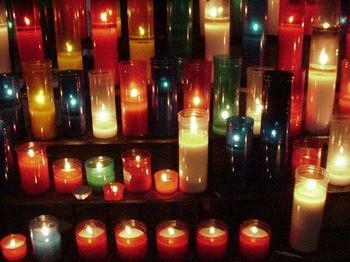 Not surprisingly, there are number of spiritual paths that practice candle magic. On a basic level it’s about two things: 1) INTENTION: The candle helps us to focus our intention/prayer concern. It serves as a meditative device through which we can channel our energies and ask for help from the Divine Presence and the elemental spirits/powers. 2) FLAME: The flame is the “transport device” that sends our intention/prayer concern to its desired recipient. It acts as a bridge between the material and spiritual worlds. CLEANSING: This step is to remove all the negative energies that the candle may have picked up along the way. Some do this with sea salt, moonlight or sage. Others literally clean the candles with oil to remove dust and dirt. They will also take the time to trim the wick, carve away any unwanted wax, and add symbolic carving. ANOINTING: This is also sometimes called “dressing” while others call the entire process “dressing.” The idea is to anoint the candle with some kind of special oil and dedicate it for ritual use. There are lots of different opinions as to how this oil should be applied, and what words should be said, but anointing is in every tradition I’ve studied. CHARGING: This is the opportunity to attach to the candle your specific request/intention. Some traditions place a piece of paper under the candle that has the person’s name written on it as well as the intended request. Others simply charge the candle by prayer/visualization. Charging is also the opportunity to ask the Divine Presence and elemental spirits to help manifest your request. This can also be done during the anointing as well. LIGHTING: This goes without saying but it is the final step. Some then continue to focus on the candle as they repeat/visualize their request. For those of you who practice candle magic out there, I’d love to know what your tradition looks like and whether these step are involved or not. Whatever the case may be, candle magic can become a powerful part of our spiritual practice no matter what faith tradition we come from. This entry was posted in Magic, Meditation, Prayer, Spirituality and tagged Candle Magic, Christian, Pagan, Spirituality, Wicca. Bookmark the permalink.